Movie free listed from 20 September 2018. No Sesame. All Street. 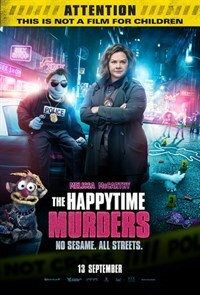 THE HAPPYTIME MURDERS is a filthy comedy set in the seedy underbelly of Los Angeles where puppets and humans coexist. Two clashing detectives with a shared secret, one human (Melissa McCarthy) and one puppet, are forced to work together again to solve the brutal murders of the former cast of a beloved classic puppet television show.